Allergistic is a first-of-it's-kind mobile app tailored to helping deliver a smooth allergist daily workflow. Manage your extracts with accuracy. Allergistic tracks lot #'s, expiration dates, and much more. We provide built-in catalogs from the industry's top extract manufacturers, and even provide you with easy ways to get your extract vial inventoried using auto-detect image processing technology. We can store your patient data on Google's HIPAA-compliant backend using Google's Team Drive, and more cloud provider options coming soon. You can also just store your data locally on iPad or iPhone. Either way, we provide you with insights on your Allergistic data at a global or patient-specific level. Enter results swiftly, and see reactions in real-time. Record your patient's skin test results quickly without picking up a pen. We handle both percutaneous and intradermal skin testing, and allow you to track at a per-site level everything from the wheal and flare (quantitative or qualitative), to the shape of the reaction (normal, pseudopod, or satellite). With a single tap, we quickly allow you to add a non-reactive percutaneous site instantly to the intradermal test, and also allow you to swap it out with another extract or mix of your choice. It beats paper, and it's a whole lot more shareable and reusable. Get your maintenance concentrate prescriptions built quickly based on skin test results. Allergistic provides an intuitive Rx Builder that you can customize to your practice needs. We support single or multi-vial prescriptions that you can label accordingly based on your patient documentation requirements and refrigerator organization. Build patient treatment sets based on the prescriptions you write. 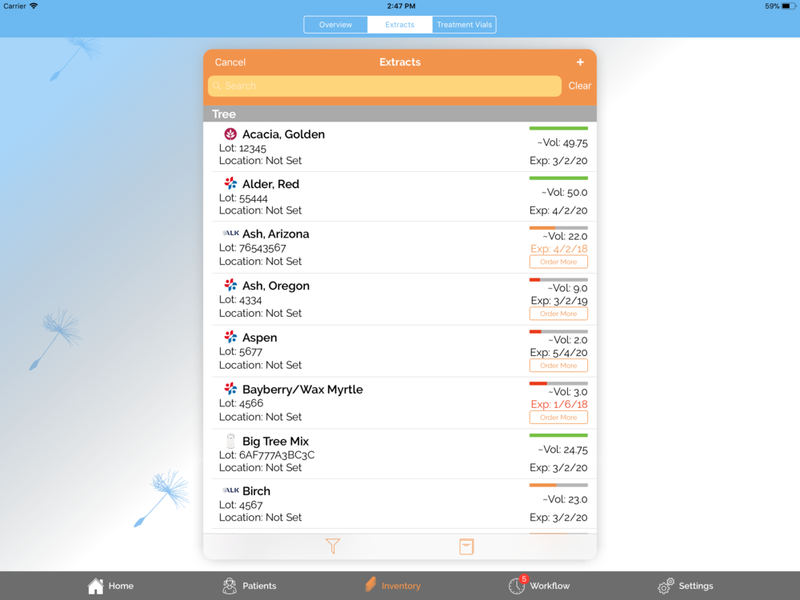 Allergistic takes care of the math and guides you as you build out a patient's treatment set. Quickly create single vials of a specific dilution, or create a whole ten-fold set of vials. 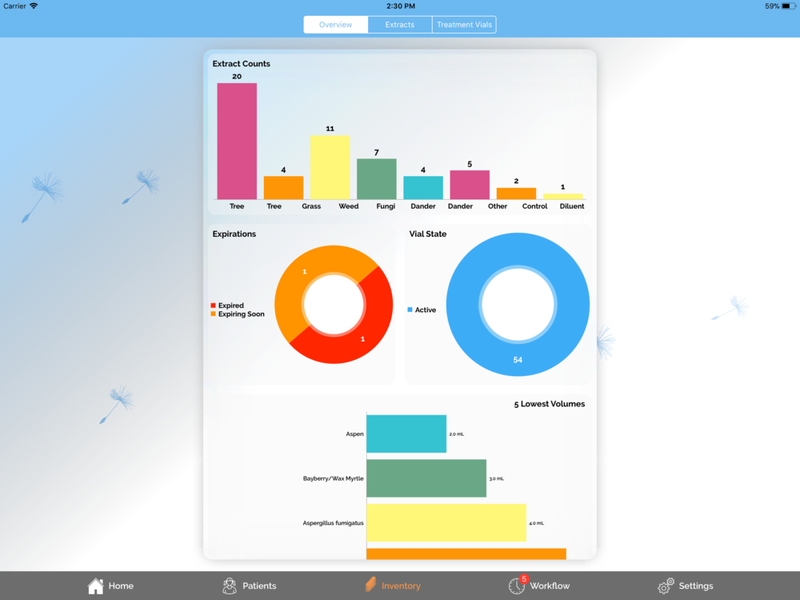 Allergistic allows you to build the patient shot schedule any way you see fit. Allergistic features shot location recording, shot holding, and maintenance doses. Don't stovepipe your patient's data. We leverage tried and true, commercial-strength storage solutions. Our platform is built to take advantage of the latest in iOS security technologies. If you choose to link up with a cloud provider like Google Drive, you automatically gain the benefits of strong security when the data is at rest. When the data is in-transit over the Internet, we use industry standard HTTPS/SSL. Your patient data is safe with us, and it doesn't require VPN or other heavy IT setups. You are clinicians in the medical field, so why should you also be cybersecurity experts? Drop us a line and let us know what else you would like to see! Copyright © 2019 Riverbay Softworks, LLC. All rights reserved. Allergistic® is a registered trademark of Riverbay Softworks, LLC.